On July 27, over 100 guests attending the recent Art for Art’s Sake ‘Kick-Off Soiree,’ enjoyed viewing the art of about a dozen local artists, who were on hand to discuss their particular art form. They also enjoyed sampling the culinary artistry of Chef of Distinction, featuring an exotic array of appetizers and desserts, listening to the musical stylings of Theory DeJean and David Young, flutist. The chic Soho warehouse-style of the impressive Water Mill Flowers Design Center provided a warm atmosphere for socializing with old friends and making new friends. 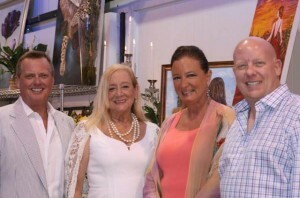 Kim Naimoli is President of the Opera Society and William Riddle is the Founder/President of the Venetian Arts Society; the two organizations that sponsored the evening. “We are so grateful to William, who has been a friend to the community at large over the past few years,” said Kim in welcoming members of the Opera Society and the Venetian Arts Society. William Riddle is also Director of Special Events at Water Mill Flowers & Design. Kim also extended a special thank you to Watermill owners Tom Dowd and Cesar Rivera, who worked with their design team to create a magical setting filled with flowers, art, and the warm glow of candles. “The Soiree served as a sneak preview of a new Opera Society fundraiser that will take place next year,” enthused Barbara Lefka, who conceptualized the idea as a way to showcase some of the artists in the community. That signature project is planned for March 8th and 9th at the Josephine E. Leiser Center and will feature more than two dozen artists, whose works will be for sale. A portion of the proceeds will be donated to the Opera Society, a support group of Florida Grand Opera. Opera Society artists included: Judith Langley, hand bags; Melanie Camp, Oils; Barbara Copanos, Acrylics; Barbara Lefka, Oils; Marilyn Johanson, Water Color; Crystal Bacchus, Water Color, Countess Heide von Schlieffen Jewelry; L.A. Cline, Pastels, Elaine Ziffer, Jewelry; and Tania Oosthuizen, Oils. Artists from the Venetian Arts Society included: Jerry Craig, Mixed Media; Gisele Haselbarth, Acrylics; Vaughan Tucker, Oils; Angela Esper-Pena, Oils; Sonia Lewis, Oil & Objets d’arts; Maria Salgado, Jewelry and David Muir, Photography. In keeping with the Venetian Arts Society of creating monthly ‘Salons,’ modeled after the concept that began in private homes in Italy in the 16th century and flourished all over Europe… especially France in the 17th and 18th centuries, Riddle welcomed Lars Hegelund of Fredrick’s Fine Art, a VAS member, who discussed “The Art of Collecting.” “Those salons usually attracted poets, artists, politicians and others who enjoyed engaging in stimulating conversation and meeting the leading creative people of the era,” he noted. The Opera Society is a support group of Florida Grand Opera. For information, call (954) 533-6373 or visit www.theoperasociety.org. For information about the Venetian Arts Society, call (954) 709-7447 or visit www.venetianartssociety.org.